FEBRUARY 25th & 26th – Celebrate winter in the heart of the city at Bloor-Yorkville’s 12th Annual Icefest! 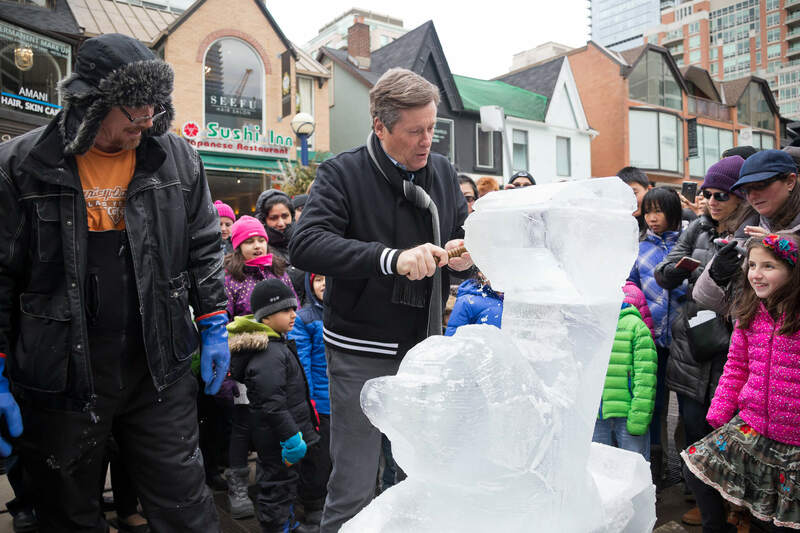 On Saturday, February 25th, Bloor-Yorkville invites Toronto to watch professional ice carvers face off in the 17th Annual Sassafraz Ice Carving Competition in the Village of Yorkville Park and to stroll through the neighbourhood, where they will see many creative and awe inspiring ice sculptures. There will be a street closure both days on Cumberland Street and Bellair Street. 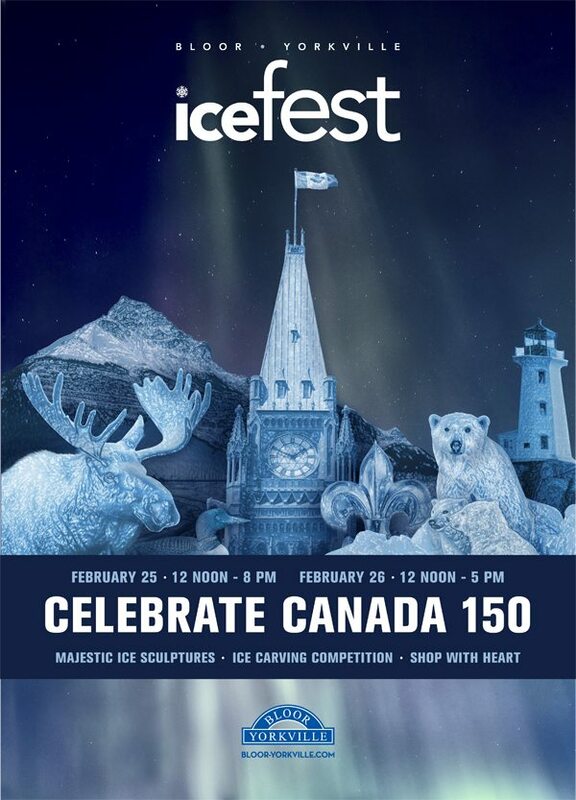 Icefest provides an exciting schedule of activities for all ages including; spectacular Ice Sculptures created, on site, throughout the neighbourhood, extravagant Display Sculptures to be setup outside participating businesses, a magnificent “Canada 150” focal point ice exhibit in the Village of Yorkville Park, ‘Maple Syrup Taffy Station’, ‘Ice Kiddie Cubes’ and a ‘Shop with Heart’ fundraising event at participating retailers. All proceeds go towards the Heart & Stroke Foundation of Ontario. BEST OF ALL: BIA members have several opportunities to get involved! Many businesses are already planning for this event. This is the 12th edition of the Festival and we would like to make this the most spectacular year to date with a record number of ice sculptures in the Village of Yorkville Park and throughout the neighbourhood in celebration! To do this we need your help and participation. You can sponsor a Competition Sculpture ($625) for the 17th Annual Sassafraz Ice Carving Competition in the park, as Bloor-Yorkville invites Toronto to watch professional carvers face off on the Saturday of the Festival; OR you can sponsor a 3-Block Exhibition Sculpture ($1,300) or a 5-Block Exhibition Sculpture ($1,800) and have your ice sculpture located outside your place of business or in the Village of Yorkville Park. An estimated 30,000 + people are expected to stroll through the neighbourhood to see this year’s showcase of awe inspiring ice sculptures. February is Heart Month and our charitable partner, once again this year is the Heart and Stroke Foundation and a portion of all ice sculptures sponsored will be donated to the cause. We will also have a ‘Maple Syrup Taffy Station’ and ‘Ice Kiddie Cubes’ for a $2 donation to the Heart & Stroke Foundation. We are also bringing back the ‘Shop with Heart’ fundraising event and call on all retailers and restaurants to get into the spirit of the festival and participate, by offering a percentage of sales to the Heart and Stroke Foundation, on the weekend of the festival. This is your chance to help a worthy cause and give your business some positive exposure and generate instant sales increases. Your business will be featured as a “Point of Interest” in the Bloor-Yorkville Icefest brochure and event map, along with a listing on the event website. February is Heart Month; together we can support heart health and our community, by displaying a Heart and Stroke Foundation donation box at your business for the month of February. 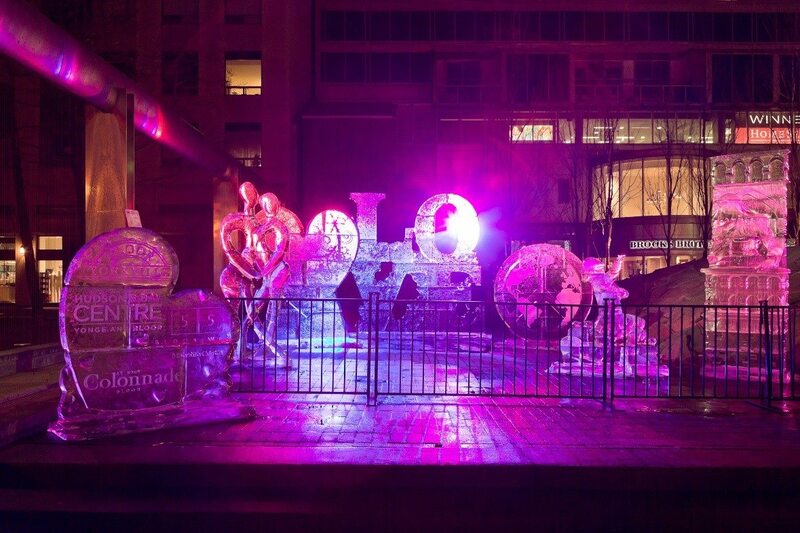 Retailers are also encouraged to have in-store events and promotions to coincide with Bloor-Yorkville Icefest. – Sculpture created live on Saturday, February 25th in the Village of Yorkville Park in front of spectators. 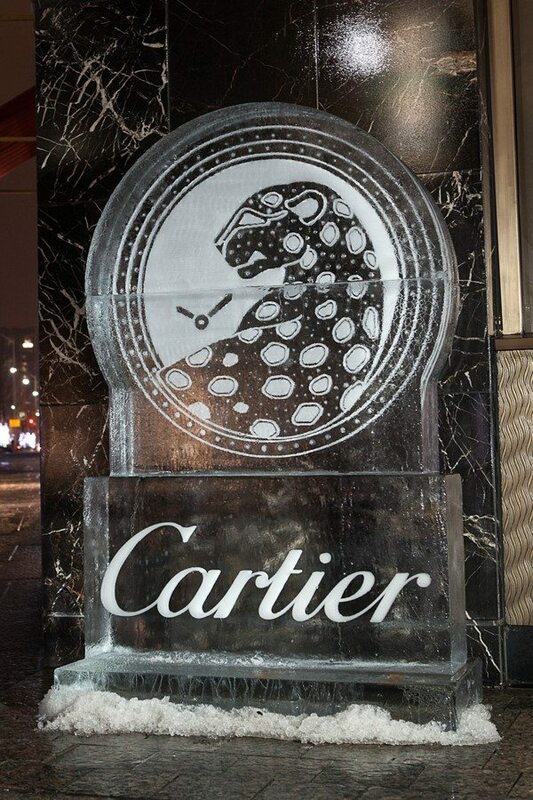 – Sculpture is a 300-lb block of ice set on another 300-lb block base with your logo. – Your business name will be listed on www.bloor-yorkville.com as a Competition Sponsor. – 3 block x 300-lb Sculpture – can be logo based, or free standing. – Completed Sculptures will be delivered to your premises on Friday, February 19th. – Sculptures can remain, at your premises, until they melt. – Your business will be a ‘Point of Interest’ location on Bloor-Yorkville Icefest 2017 brochure (75,000 copies) inserted in the Toronto Star. – Your business will be listed on www.bloor-yorkville.com as an Exhibition Sponsor. – 5 block x 300-lb Sculpture – can be logo based, or free standing. – Your business will be a ‘Point of Interest’ location on Bloor-Yorkville Icefest 2016 brochure (75,000 copies) inserted in the Toronto Star. – Business name will be listed on www.bloor-yorkville.com as an Exhibition Participant. We would also appreciate your donation of a prize to be included in the ‘Bloor-Yorkville Prize Package Draw’. Spectators, who vote for their favourite ice carving competition sculpture, automatically can enter in the draw, which will be featured in the Bloor-Yorkville Icefest 2017 brochure (75,000 copies) and event website. Your logo will be included on signage on site at the BY BIA Tent, during the event.